This Christmas, we're supporting Child Bereavement UK - a very worthy cause indeed. Buy an animal onesie after following the link below, and we'll donate £10 to help their cause. Child Bereavement UK exists to help children and families deal with bereavement when a parent, sibling or child dies. Our Managing Director and top animal costume model, Will Morris, said: "This is a truly excellent cause. Dealing with grief is always difficult, but no one should have to face that struggle alone, especially children at Christmas time. So we're really pleased that this charity exists, and we're really pleased to be supporting their cause this Christmas". Make sure you make your purchase after following the above link, as it's the only way we'll be able to track it in order to make the donation. 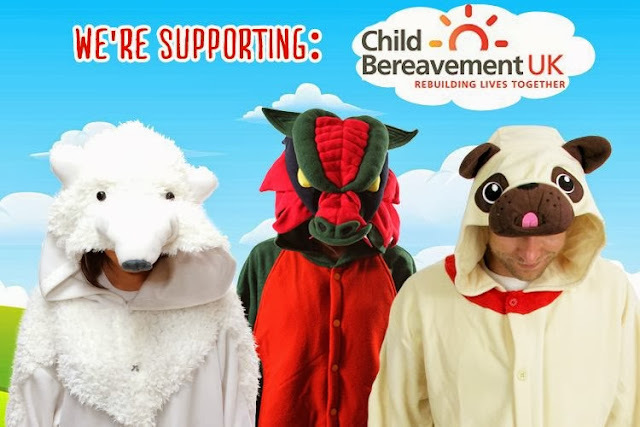 Here it is again, just to be sure: http://www.animalcostumesshop.co.uk/?utm_source=ChildBereavementUK&utm_medium=FB&utm_campaign=ChildBereavement10. If you're making an order via telephone, please quote 'CBUK' to take advantage of this offer.